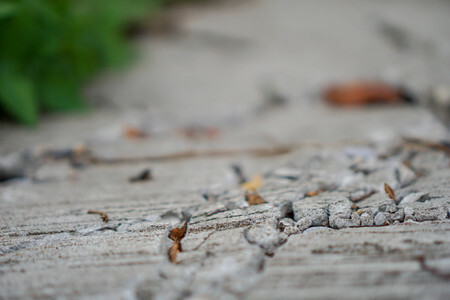 Over time, many homeowners find cracks and other issues in their concrete driveway. As the material breaks down and separates, these unsightly divots can prove frustrating. While winter weather is the number one cause of sunken and cracked driveways, there are many reasons why it could be happening at your home! Sometimes contractors rush through the necessary steps when laying down the driveway and if the crushed stone base is not packed down tightly, cracks are inevitable. Some contractors will also save money by using sand or dirt substrates which expand and contract with changing temperatures, also leading to cracks. The only way to resolve this is to replace the driveway completely. If a vehicle or object weighs more 10,000 pounds, your driveway will take a beating. These cracks become easy entry points during winter for snow melt-off and salt which can further damage the driveway. Speaking of salt, using the substance to melt ice on your driveway can wreak havoc on the concrete due to the freeze-thaw cycle. Using sand instead of salt can prevent damage and provides traction for your vehicles to stop slippage. When tree roots grow underneath the driveway, they place uneven pressure on certain parts of the driveway. When pouring a new driveway, consider where the trees are in your yard and plan accordingly. Templin Concrete specializes in all types of concrete construction, including tear out and replacement of concrete driveways, sidewalks, steps, patios, concrete countertops, all types of floors, and decorative concrete. Call us at 612-388-1945 to speak with one of our professionals and learn more about concrete driveway repair!